by Erin McCullagh. Illustration also by Erin McCullagh (click for full size). I sit here right now with words in my head running too fast for my fingers to type. In front of me on my desk is a sheet of paper with many, many human faces with varying expressions drawn onto it. I am singing along to the low, sweet and rugged voice of Justin Vernon as he croons to the riffs of an electric guitar. In short, I am practicing no less than three forms of creativity at this very moment. 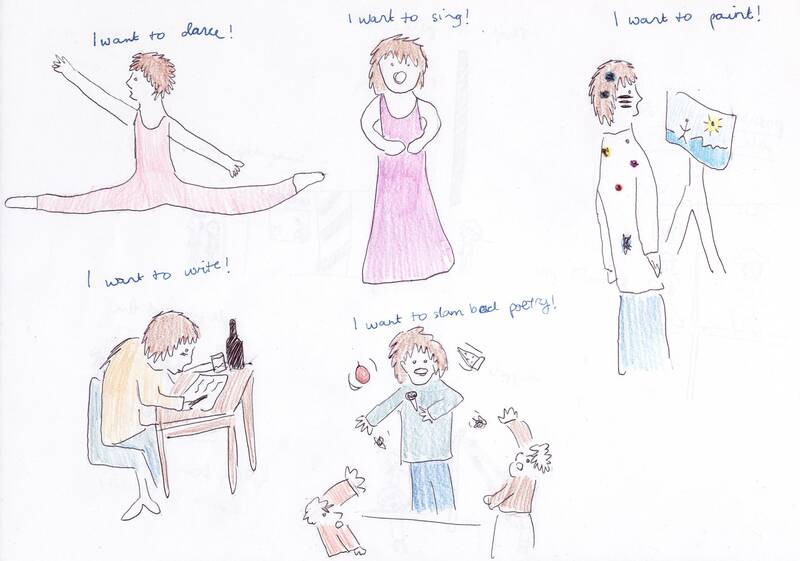 None of them really especially good (the drawing and the singing in particular), yet I’ve always been a person who tended to dabble in different things before deciding on a particular one. The imagination is a funny thing. There are things that come to me, conversations that should be written down, the looks on people’s faces that can’t be described but have to be drawn, a combination of dance moves to a portion of a song I’m listening to on the bus, that defy what I would usually like to think of as the strictly ‘prose only’ mind I possess. Since I was about eleven years old I’ve always thought of myself as a writer and purely that. I’ve had my other phases — ballet at three, piano at ten, drawing at twelve — but writing has always been the one I have stuck to, with faithful attempts at NaNoWriMo every year (though very few actually successful ones), and the churning out of a short story every now and then to please the relatives. But as life has gone on and the NaNoWriMo attempts have begun to clock up (don’t even talk to me about November this year), I’ve begun to think that maybe my trouble with expressing the thoughts in my head has been an issue of not using the right medium. I don’t think in prose, after all; I tend more to see my characters and the events that happen as a sort of action movie which I then have to describe. And, yes, this will then entail hours of sitting around, spinning on my spinny-chair next to my desk trying to describe that look or that movement, whittling the time away and coming away with an unsatisfactory expression in the end anyway. Yes, this is how I spent most of the month of November before giving up on my 50,000 word goal. The shame! A period of self-reflection followed my failure of a November. Am I really a writer? Is this idea in my head really something that was meant to be put onto paper, or did it belong on the movie screen? And where on earth would I find the funds (and the time) to style myself as a film director and put my future award-winning plotline onto the big screen? Or was I being a little too ambitious about a film? Perhaps a comic book? That way, I wouldn’t have to be rich, I would only have to be an artist. Hmm, I see a few problems already. I am sure that my pain isn’t unique. All creatives must reach that point where they experience a crisis of confidence. It just goes with the territory. For years now I’ve known that I am a creative of some sort, but whether that means a writer, an artist, a musician, a dancer or a collector of teacups is something I have yet to decide. Can I be more than one? I think in many senses all creatives are an amalgamation of more than one creative medium. Our brains simply can’t deal with one outlet and must go for several different ones at the same time. I can cite my sister, who has tried writing and now choreographs. I can cite Nick Cave, who has written fantastic music for a long, long time and churned out a couple of novels and screenplays in the process. I can cite those numerous Hollywood actors who decide sometime in their plastic-surgery-enhanced, fake-tanned-chihuahua-filled careers that they were also meant to write novels about as successful as their acting careers… but that would probably not be a good idea. So should we be more than one? Should I decide to work intensively on my artistic skills at the same time as I speed-write blog posts and work on characterisation techniques? Or should I decide that writing is my jam and just work on that for the next few years (or until the next crisis of confidence)? I’m sure my writing skills could do with some intensive work, but what if there is an artist in me just waiting for me to give her some time with a Japanese pacer? The questions are endless! I’m going to finish by saying that we shouldn’t limit ourselves. If we feel the need to write, we write. If we feel the need to draw, we draw. If we feel the need to dance around, or sing badly along to the radio, or audition for the next musical by Canberra Philo, we do. That is what being a creative is about. We are a sporadic, ever-changing species, and we do whatever we want. Limiting ourselves to one thing is like those authors who decide they will write a whole book without the letter ‘E’, or a musician deciding that they will spend their entire life playing the timpani and only the timpani. The joy of being a creative is that we are creatives and have a license to dabble in whatever we want. So unleash those artistic bugs! Create mediocre artworks and leave them in shoeboxes in your cupboard! Write whole mediocre symphonies, choreograph wild dances to songs by The Beards and call it contemporary! Try your hand at acting! Write bad poetry! And then write blog posts about your experiences, like I do. Keep an eye out in early January for Erin’s next post, before she starts sending us missives from Japan!